The epdm (ethylene propelene dimethane) powder coating was laid on re-furbished cement based surface for making rubberized layer. A gum (mdi-methyl dimethyl isocyante) based technique used for preventing erosion and sustain all weather conditions. It is supposed to have an antifungal, anti-microbial and uv resistant properties. Volleyball is a team sport in which two teams of six players are separated by a net. ... Typically, the first two touches are used to set up for an attack, an attempt to direct the ball back over the net in such a way that the serving team is unable to prevent it from being grounded in their court. 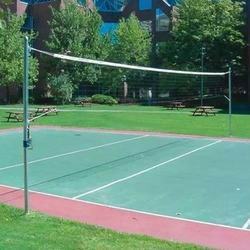 We are offering to our valued customers a quality range of volleyball surfaces. Both for indoor & outdoor applications. The various surfaces offered are suitable for competitive play. 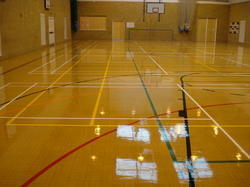 We hold expertise in offering a superior quality range of Volleyball Synthetic Flooring.